First I have a knitting update and then I have some printing progress to delight you all with. First things first, because they are first, I have finally finished my Berry Socks!! *Screaming applause* It took me long enough. I started these way back in October of last year and after a while I simply stopped knitting on them, but I ploughed through and finally finished them about 2 weeks ago and have been wearing them as sleeping socks. I am really picky about my socks not having a cuff that comes too far up the leg (I have very large calves from walking everywhere and they always seem to be too tight) so I made these with a shorter 30 row cuff as opposed to the 60-odd rows it was supposed to be. One good thing about doing this is that I always seem to have some wool left over! I actually have nearly half the skein left on these so I could knit up some more with a smaller needle size for some tighter socks. 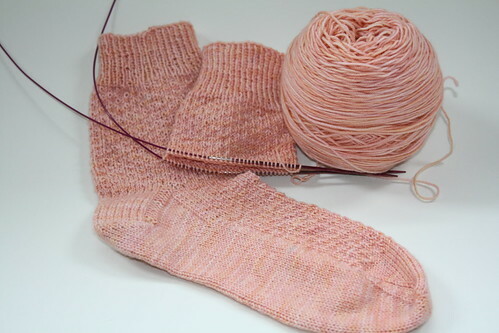 Pattern Name: Regia Bamboo Sock Knit Kit/Made up in my own head. Problems: I turned the second heel slightly differently then the first because I couldn't remember which way I had done the first one! Modifications: I CO 60 sts, Knit 1 row to join, knit a K1P1 rib for 5 rows and then knit in sockinette for 27 rows, the heel hight is 25 rows, with slipped stitches at the ends. The numbers for most of this came out of my own head, not following the pattern. Skills Learnt: My first sock and my first turned heel! Knit again: Probably not in the same size. Next up I have an update on my Hermione Everyday Socks, I am about 4 pattern repeats from knitting the heel flap on these (I am only doing 12 repeats, not 18), I will possibly sit and do that later while catching up on some Supernatural that I have on DVD, knitting and Dean Winchester, the perfect night's entertainment! And I just have one more knitting project to show you, when I completed the Berry Socks I felt I should have another project on the needles so I started this lovely Anisette Shawl. 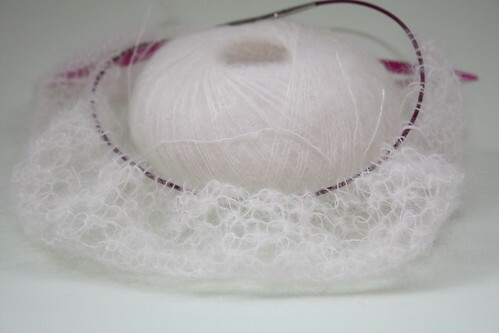 I am using Kidsilk Haze in Cream for this one, and I am making it to the wrap size dimensions instead of the scarf. this is strictly for when I want to concentrate though what with the yarn being so thin and the wrong sides not just being straight purl I have to actually think about what I am doing. I love the yarn though (I knew I would) It's like knitting a cloud. 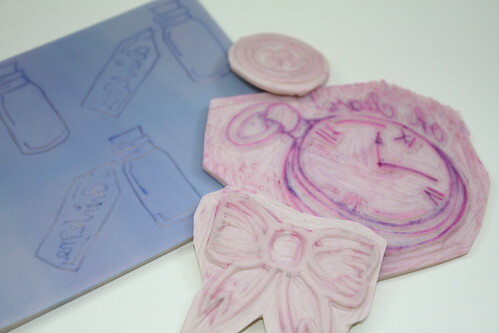 On the printing for the shop front I have been creating lino cuts along certain themes lately, the first being Alice in Wonderland. I have made a bow which will be blue, some 'Drink Me' bottles and the White Rabbit's Pocket watch. 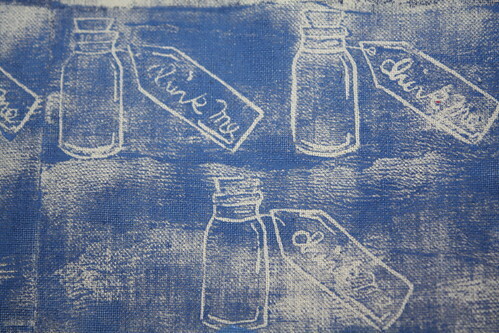 I spent some time last night printing the drink me bottles and I do have to perfect how much ink I need on the lino before I stamp it, and I have found that a heavy candle works better as a roller then my rolling pin! Cute huh? 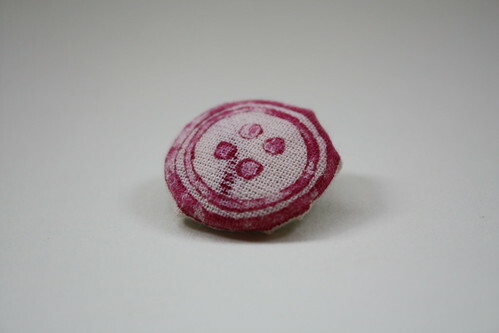 Looks like a button, and is a button, I crack myself up! P.S. I got some great yarn the other week from 3AM Enchantments over here on etsy, The skein is wonderful and I am waiting for some better light so that I can show it to you, but go check them out!